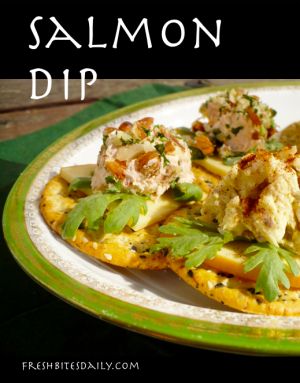 I had an experience with salmon dip at a party that was so memorable that I have wanted to reproduce it for years. Quite unashamedly, I hung around the dip on the snack table at the party, dipping in and inquiring as to who made this heavenly concoction. The cook arrived on the scene. In her describing the recipe, I thought to myself, “There is nothing new here.” Then I asked her what brand of canned salmon she used. It turned out that she and her hubby caught and canned their own! That was the difference: a superior quality canned fish. Our top recommendation for canned salmon that will knock your socks off is right right here. We have been satisfied customers for over seven years and now partner with them on this website. If you haven’t purchased from them before, there is a 10% for new customers (Coupon code: VCAFINT) to give the product a try. Myscha Theriault of Wise Bread has a useful post on ways to enjoy canned salmon. I am using her dip recipe here. 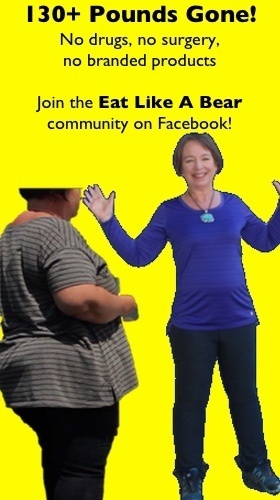 Her tag-line is “Living Large on a Small Budget”. That is exactly the flag I would fly over this dip. The dip is best if the flavors have a few hours to blend but we have consumed enough of this goodness freshly made to vouch for its flavor. The dip itself is rich and satisfying. It can certainly stand on its own. Add the parsley-almond topping and you not only create a party plate, but add nutrients and texture to the whole experience. This dip really is about living large. Add the salmon to the creamed cheese. Add all the contents of the can, including the oil. Some of the most precious nutrients are in the oil. A good quality salmon is often bone-free, but check for bones anyway. Check for skin, if you find any, pull it from the dip bowl and consume it yourself. Consider it a tip for making so sublime a treat. Add the onion and garlic and stir until all the ingredients are mixed into a uniformly pink creamy wonder. Taste for seasonings. You may want to add salt and pepper, a few dashes of hot sauce, some fine ribbons of fresh basil leaves. When making these adjustments, keep in mind what you will be dipping the salmon with — vegetable sticks or something salty like crackers. If the answer is vegetables, you will probably like a little salt added to the dip. 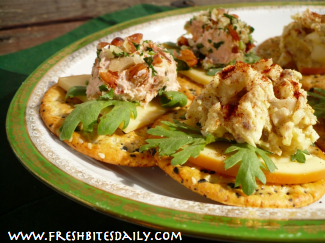 Spread the salmon dip on a serving platter. I suggest reserving a little to enjoy on the front end. This will keep you from scraping around the edges of your party platter before the party begins. 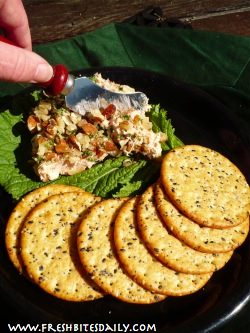 Mix the minced parsley with the chopped almonds and sprinkle over the salmon dip. Cover lightly and refrigerate for a couple of hours to give the flavors time to meld. Retrieve it from the refrigerator about an hour before serving. The salmon dip is more flavorful at room temperature. We have kept this dip in the refrigerator for four days without any sign of quality loss. In most scenarios this dip will not be around that long! This dip is bare-bones basic. Each time you make it you can experiment with added flavors. For instance, add a bit of minced hot pepper, some lime juice, and minced cilantro. Alternatively, try minced basil in the dip with parsley, toasted pine nuts and grated parmesan on top of the dip. Be creative and have a blast! Shared at Gooseberry Patch’s New Year’s Eve Appetizer Round Up. 1 Comment on "If you have a good quality canned salmon, this dip may just blow you away"
So thrilled you enjoyed the canned salmon article over at Wise Bread. This dip has always been a fave, so it’s nice to see that someone else values it so highly. Looking forward to checking out your video.